Happy weekend Bootleg Biscuits fans! Just a short note to bring you up to date on a couple new venues for our rewards. Our wonderful rewards have found a new home at Indigeny Reserve our local cider works! This is a wonderful family run and owned business featuring local artisan products in addition to their own ciders! 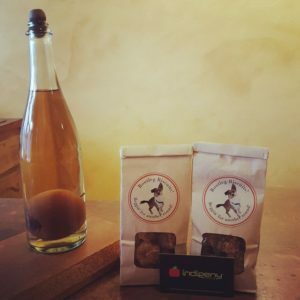 Indigeny is in a beautiful setting amongst the Sierra foothills surrounded by apple orchards. Bootleg Biscuits are available for purchase as well as for a quick taste if you bring your canine buddy in while you sip cider! Also, our friends at Faction Brewing have our treats available for tastings (and pairings…tee, hee!) by your furry buddies! I’m sure our rewards will have your pup beggin’ for another round!